The Loti offers French cuisine .The Tse Fung offers Traditional cuisine. persons in conference or for seatdown dinners and 350 person for standing cocktails. MEMBER OF CHAINE DES ROTISSEUR. MEMBER OF PENANG HOTEL CHEF. 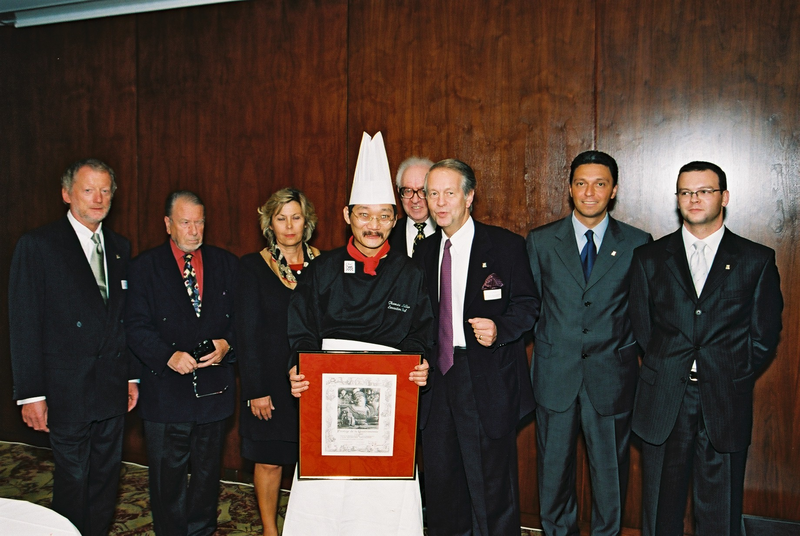 MEMBER OF ACADEMY NATIONAL DES CUISINIERS. MEMBER OF INTERNATIONAL TOQUES BLANCHES. SPECIALITY: PACIFIC RIM (FUSION KITCHEN) . Ginza project holding includes 106 restaurant and show-business projects in diferent formats and price seg­ments. The company has been dealing with restaurant foun­dation and management since 2003. Te holding includes 59 concept restaurants in Moscow, saint-petersburg and new-York. flower boutique “Cvetochniy domik Ginza”, Domik Boutique Hotel. Besides, since 2005 the holding has been developing “Yaposha” middle price bracket project. Currently the network consists of 40 sushi-cafes in Moscow and saint-petersburg. Also the holding includes the service of Mikhailovsky Teater, Vip reserve, Ginza project Cater­ing, Ginza prime, Ginza fitness and Ginza Design . 4 food and beverage outlets, Restaurant Adjara, Biscuit Lounge Bar, 24/24 hours Room Service, Pool Garden, 5 conference and banquet rooms for seat down dinners up 200persons and standing Cocktail up 400 persons. Kitchen management: 1 Executive Sous-Chef, 2 Sous-Chef, 1 Executive Pastry Chef and 20 kitchen staff. 1 chef steward, 12 stewards .Food cost 29% and labour cost 22%. Best Fine Dining Restaurant in Town. From a small private party, to a most refined banquet - we carry out services on any level. "Concord" has been a leader of catering in Russia. Our motto is "New steps every day." Our banquet's locations include, not only the whole of Russia, but also Europe and Asia. The company "Concord" is not only the organization of the most refined banquets, weddings, cocktails, and many other celebrations, rent of Palaces and museums, but also elite restaurants of St. Petersburg - the restaurant-palace of Count Stroganov the "Russian Empire", the restaurant of haute cuisine "The Old Customs House", the restaurant-ship "New Island", the restaurant-party-house "Russian Kitch", the restaurant of Russian and Soviet cuisine "Na Zdorovie", restaurant "Cheval Blanc" and "River Palace" in Moscow. Main Caterer for Russia Goverment ,White House Moscou and Kremlin for President M.Putin and M.Medvedev . I was hire to the pre opening and opening ,The Gallery Club as Senior Manager and Executive Chef, with 9 outlets food & beverages Coffee Shop, Fine dining signature restaurant “Fusion & Molecular food”, National and regional kitchen, Modern Italian concept, Lounge Bar, Japanese restaurant with 12 Tepanyaki tables and Sushi Bar, Pastry and Gourmet shop , 3 VIP room's banquet facility site down dinner up to 500 persons and standing Cocktail up to 800 persons , including heavy Outside Catering Schedule up to 1000 persons ,with over 220 staff and 800 covers a Day. Providing to the russian chefs, 30 weeks academic cours, culinary training, To receive an outstanding foodservice education, including lessons on culinary techniques, pastry, flavor strategies, wine studies, menu development, and culinary trends. 50 modules international cuisine and pastry cours ,each modules in 25 hours ,90% pratical and 10% theory . With senior sponsor compagny "la marée" and DeBuyer . Altawil Food Services has been a rapidly growing part of Altawil Group. What has started with a catering services operation has developed through years of experience into a multi-activity support services provider.Our highly qualified staff have always been the key element in delivering a wide range of support services in world-class standards and with professionality.Services that we render to our clients vary in speciality and genere to include: Catering Services,Landscape & Security Services,Recreational Services ,Housekeeping & Laundry Services,Janitorial Services,Camp Operation & Maintenance.Altawil Catering Services are available to workforces on Jobsites, in Camps, in Staff Canteens and Cafeterias, in Hospitals, in Universities and other institutions. In business and to private customers with banqueting requirements.The standard catering package includes three meals a day, seven day per week. All menus are based on the specific needs on the clients. Menus are available for any nationality. They range from Western through Arab, Indian and Pakistani, Indonesian, Thai, Philipino and Korean to African cuisines, such as Sudanese and Kenyan. All foodstuffs used are of choice or Grade A quality.The operational team in the field – highly qualified cooks of different nationalities and well trained. Courteous serving staff – is supported by a skilled and experienced management team of both regional and head offices. Support services consist of procurement, domestic and international purchasing, culinary assistance in menu planning and presentation, development of specific food specifications, hygiene, sanitation and bacteriological control, kitchen planning and equipment, quality control and personnel training.In view of the extreme climatic conditions in this country, meticulous attention is paid to storage, stock control and stock rotation, ensuring ideal storage conditions for deep-frozen and cooled stocks as well as fresh produce. 5 food and beverage outlets,Restaurant Les Quatres Saisons,Téséo coffee shop, Inagiku", Japanese restaurant,Vivaldi Lounge bar ,8 conference and banquet rooms for seatdown dinners up 500 persons and stainding Cocktail up 1000 persons.Kitchen management :1 Executive Sous-Chef, 3 Chefs de Cuisine, 4 Sous-Chef ,1 Executive Pastry Chef and 15 kitchen staff and 400 to 600 covers a day,food cost 30% and labour cost 29%. Restaurants: Mövenpick Cendrier Centre, Fusterie, Yvorne Est , Yvorne Ouest , Marche Martigny and Hotel : Mövenpick Hotel Geneva , Mövenpick Cadet Hotel Geneva and Mövenpick Hotel Lausanne for Movenpick Standards Recipes . JUNE 2000 UNTIL JUNE 2002. Restaurant Fusterie Four Operation Outlets ( Coffee Shop , Restaurant , “Baron “ Fine Dinning restaurant and during the summer time one wonderful and high Class Terrace).600 to 800 Covers a Day.Kitchen Management :1 Executive chef, 1 Executive Sous-Chef ,4 Chef de Cuisine and 4 Sous-Chef,1 Executive Pastry Sous-Chef. In their Luxury and Splendid Renew Restaurant Cendrier Centre speciality of Fusion Kitchen with Four extensive Food and Beverage Outlets ( Coffee Shop ,Restaurant and Bar ),including Banquets Schedule ,Outside Catering and Standing Cocktail facilities up 400 Persons.400 to 600 Covers a Day. Kitchen Management :1 Executive Sous-Chef, 4 Chefs de Cuisine,6 Junior Sous-Chef and 1 Production Chef,1 Executive Pastry Chef. Mövenpick & Casino Geneva , 350 rooms and suites, with 6 food and beverage outlets including catering service up 1000 persons , Restaurant Latitude ,Café Latitude, Kamome ,Maraîcher, Alibi Bar and banquets, conferences and seminars, 19 adjustable rooms for dinners up to 800 persons and 1500 persons for Cocktail. 185 ROOMS AND 50 SUITES. MEMBER OF THE LEADING HOTEL OF THE WORLD. AND SWISS DELUXE HOTEL. 8 Food and Beverage outlets ,La Brasserie du palace coffee shop , Jaan ,La Terrasse du Petit Palais ,Harry's New York Bar ,Bar Rose d'Or - bar ,Willow Stream Spa & Restaurant, Exclusive Night Club,8 meeting and banquet facilities for up to 1200 people.Catering to Chateau d'Oron and Chateau de Chillon. Kitchen Management : 1 Executive Sous Chef,1 Supervisor,8 Chefs de cuisine ,8 Sous-Chef,1 Executive Pastry Chef, 1 Chef butcher,1 Chef baker and 70 kitchen staff , 800 to 3000 cover a days 31% food cost and 30% labour cost. BELLEVUE / GENEVA / SWITZERLAND. 7 Food and Beverage Outlets,"Gourmet Shop",Cake and Desserts,"Café Laurel",International Buffet,"Lobby Bar",Snack's, "Evergarden ",Chinese Restaurant ,"Chevalier",Teppanyaki & Steakhouse,"Evergreen Club",signature Restaurant,with 11 banquet rooms,banquet facility site down dinner up to 2700 persons and standing Cocktail up to 5000 persons. EXECUTIVE CHIEF FOR PRE-OPENING AND OPENING. ACCREDITED BY:THE STATE OF VALAIS AND C.C.A. WASHINGTON.D.C. -U.S.A.